CarGurus has 303 nationwide 5 Series Gran Turismo listings starting at $7,900. Gone are the days of the BMW 5 Series wagon, which took the famed comfort and drivability of the 5 Series and added tons of extra space. Now we have the BMW 5 Series Gran Turismo, a 5-door liftback not unlike the Porsche Panamera, only taller and less performance-focused. Based on the previous-generation 7 Series, it’s tall, roomy, and features a double-pane rear opening that can function as either a trunk lid or a hatch. Introduced in 2009, the 5 Series Gran Turismo will likely be replaced by a 6 Series version in the very near future, so the 2017 model remains largely unchanged from last year. It’s designed for those who need more space than the traditional 5 Series offers but who don’t want the extra bulk and height of an actual SUV—although this target audience must not be particularly large, as it hasn’t sold as well as others in the lineup. A 3 Series Gran Turismo also follows a similar concept. The 5 Series Gran Turismo comes in three trims, with the base rear-wheel-drive (RWD) 535i starting at $60,900. Adding an all-wheel-drive (AWD) xDrive system to the 535i brings the price to $63,200, while the 550i (only available with xDrive) starts at $72,500. Powering both 535i variants is a turbocharged 3.0-liter 6-cylinder engine good for 300 hp and 300 lb-ft of torque. The more potent 550i gets a turbo 4.4-liter V8 that makes 445 hp and 480 lb-ft and directs power to all four wheels. Both engines are mated to the same 8-speed automatic as the standard 5 and 7 Series. The 535i trims will do 0-to-60 in about 6 seconds and the 550i xDrive in 4.7, and because these cars are turbocharged, they require premium fuel. Fuel-economy figures stand at 19 mpg city, 27 highway, and 22 combined for the 535i; 18, 26, and 21 for the 530i xDrive; and 15, 24, and 18 for the 550i xDrive. BMW has a well-earned reputation for building balanced, sharp-handling drivers’ cars, but the 5 Series Gran Turismo’s driving dynamics have proven a bit of a disappointment to road testers. The car rides well, but its added height displaces its weight too far off the ground and its handling is more like an SUV than a sports sedan. To help with that, BMW offers upgraded 19-inch wheels, an adaptive suspension, and a 4-wheel steering system that BMW calls Integral Active Steering. The 5 Series Gran Turismo’s plush interior, based largely on that of the old 7 Series, seats 5 passengers, with plenty of leg- and headroom. The car offers 17.7 cubic feet of cargo space accessible through a power-operated bi-modal trunk door. The rear seats can be laid down for additional room, but the 5 Series Gran Turismo just doesn’t have the cargo capacity of an SUV or a proper station wagon. All 5 Series Gran Turismos are luxuriously appointed, and the top-of-the-lineup 550i xDrive trim adds standard keyless ignition, 14-way multicontour seats, a reversing camera, and a 16-speaker Harmon Kardon audio system. Standalone upgrades include a Bang & Olufsen Surround Sound system, a rear-seat entertainment system, infrared night-vision technology, and several options bundles. A Cold Weather package adds heated seats and a heated steering wheel, while a Luxury Seating package comes with ventilated multicontour front seats. As for safety features, a Driver Assistance Plus package includes side- and top-view cameras, blind-spot monitoring, lane-departure warning, and forward-collision warning. The extra cameras, in particular, are welcome additions for tight maneuvering, as the car’s outward visibility is not ideal. 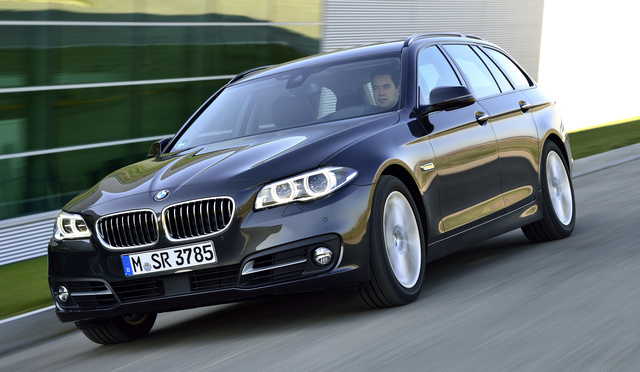 The 5 Series Gan Turismo comes equipped with a top-notch stability-control system, and the 2017 model received a 5-star overall rating from the National Highway Traffic Safety Administration (NHTSA). What's your take on the 2017 BMW 5 Series Gran Turismo? Guru9QSP5 If the 2017 BMW 5 Series Gran Turismo is "largely unchanged from last year", do you know if the 2016 BMW accessories will fit my 2017 M sport GT? Have you driven a 2017 BMW 5 Series Gran Turismo?